With this datapane you can view vessel position data from your SeaSmart device. If you have no tracker today, we strongly recommend the SeaSmartPro tracker. The SeaSmartPro automatically sends positions to your HelmSmart site where you can search for vessel position and overlay sensor data on trails. Install additional temperature sensors to monitor e.g. engine room temperature, sea temperature, outdoor temperature etc. Everything is naturally monitored from your yacht site and automatically included in your logbook or displayed on graphs or photo albums at your site. 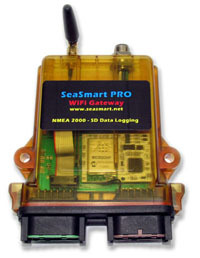 Download the data sheet to learn more or order your SeaSmartPro directly here. Worldwide shipping is included in the 595 USD price. If you already have a SeaSmart and want to connect it to HelmSmart, simply login with your username and password.